Burma has been accused of "serious abuses" against the ethnic Kachin people in a report by the US campaign group Human Rights Watch (HRW). The government has blocked humanitarian aid to those displaced by fighting in the northern Kachin state since June 2011, the group said. It said 75,000 civilians and refugees need food, shelter and medicine. Burma's government, which has made steps toward reforms, has not yet commented. The 83-page report - Untold Miseries: Wartime Abuses and Forced Displacement in Burma's Kachin State - came as Western nations consider the lifting of sanctions following recent moves towards reform in Burma. There have been several significant developments since 30 March 2011, the date on which military leaders formally handed power to the civilian government led by President Thein Sein - which is nonetheless backed by the military. The report also describes attacks on the ethnic group by Burmese soldiers. The army pillaged and burnt homes, tortured civilians during interrogations and raped women in villages, said the rights group. Fighting between the Burmese army and the Kachin Independence Army (KIA) broke out last June 2011, ending nearly two decades of ceasefire. HRW said it travelled to the Kachin state twice last year, and the report is based on interviews with more than 100 victims and refugees, Kachin rebels, aid workers and deserters from the Burmese army. The group visited nine camps in the region, as well as China's Yunnan province, across the border, where many refugees have fled. ''Both the army and Kachin rebels need to act to prevent a bad situation for civilians from getting worse,'' said Elaine Pearson, HRW's deputy Asia director. Conflicts between Burma's central government and rebels from the various ethnic minority groups have flared sporadically over the decades since the country gained independence. The government is attempting to sign cease-fires with rebel groups in preparation for further political discussions. But correspondents say that after decades of mistrust, many of the groups that have agreed a truce have done so with extreme caution. 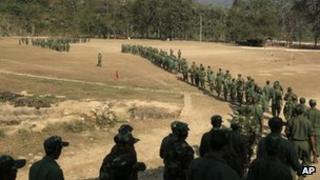 And attempts to end the fighting in Kachin state have proved difficult. The Kachin have so far refused to sign any agreement before political issues are resolved, but are now entering into talks. Earlier this month, the government held talks with Kachin rebels in the hope of brokering a truce in the decades-long conflict.